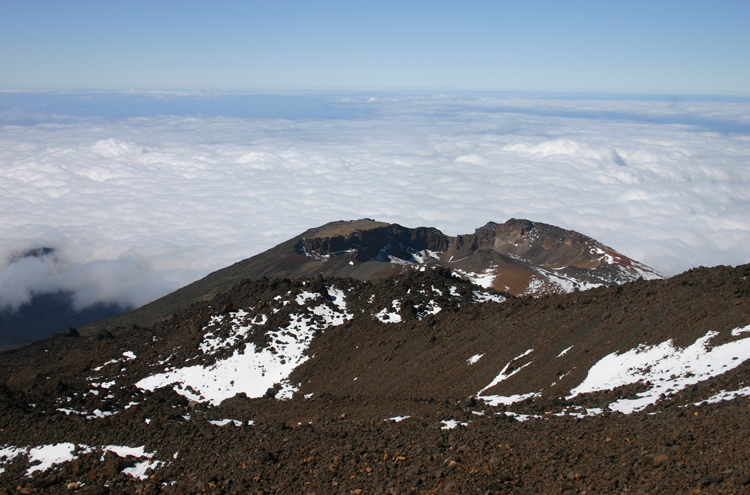 This remarkable volcanic island peaks out at 3,718m El Tiede, Spain's highest mountain. 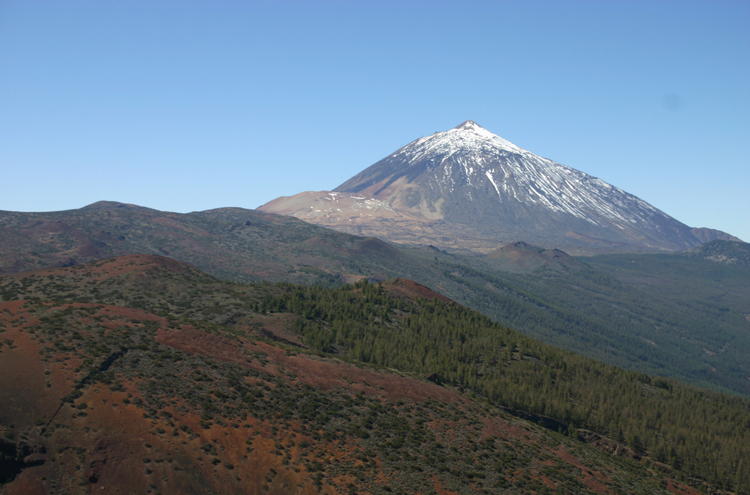 The undoubted highlight is the Las Canadas and El Tiede area, a huge caldera ringed by thousand-foot cliffs, with magnificent Tiede to the north and a dramatic floor of lava flows. 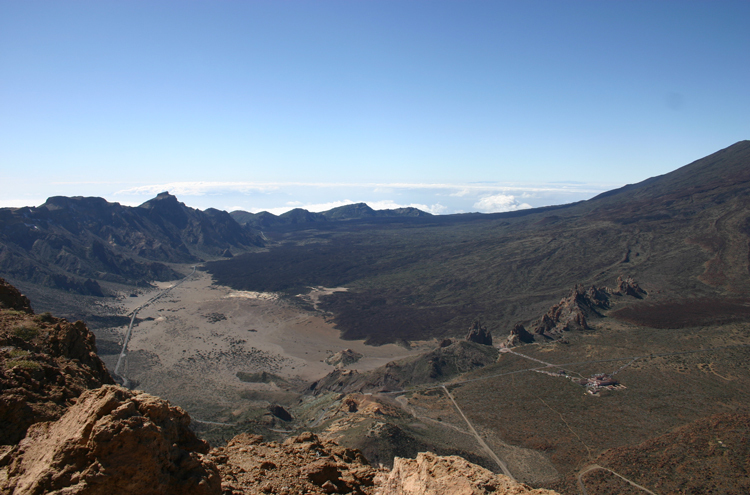 A plethora of superb trails throughout the island, from Tiede's high, cindery outer slopes to the drama and beauty of the Anaga and Teno peninsulas, to the cloud forests of La Orotava. Imagine an underwater volcano so large, it has grown from the deep ocean into an island nearly 4,000 m high. It is subject to a catastrophic collapse, the whole of its highest massif, the Canadas Edifice, falling back into the sea, leaving a huge abyss surrounded by a crescent of cliffs hundreds of metres high. In a mere 170,000 years, a new volcano grows that dwarfs the rim - remnant of its predecessor, filling the great hole with its hot spewings. It in turn is supplanted by its unruly offspring, so energetic that it nearly overwhelms its worn-out parent, growing so that it stands more than 500m above it, the tallest mountain in a mountainous country. That island is Tenerife; that clogged-up abyss the Las Canadas caldera, that young mountain, El Tiede. 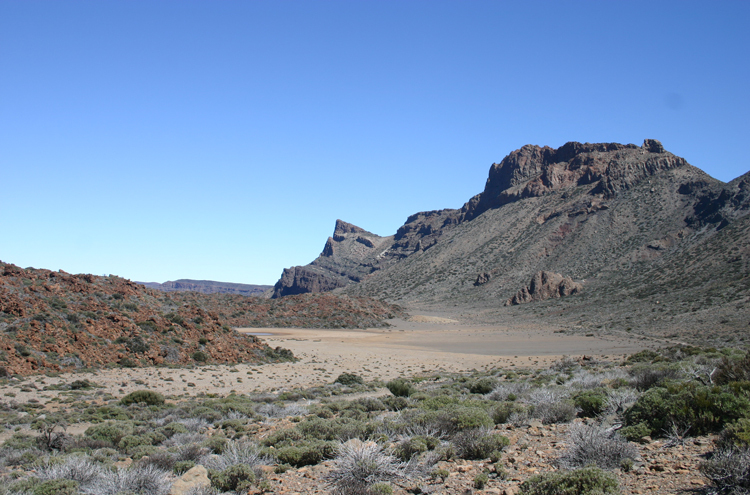 When the Canadas Edifice collapsed in a northward landslip, it created a huge caldera - now called Las Canadas - surrounded by a great jagged curve of cliffs to the South. 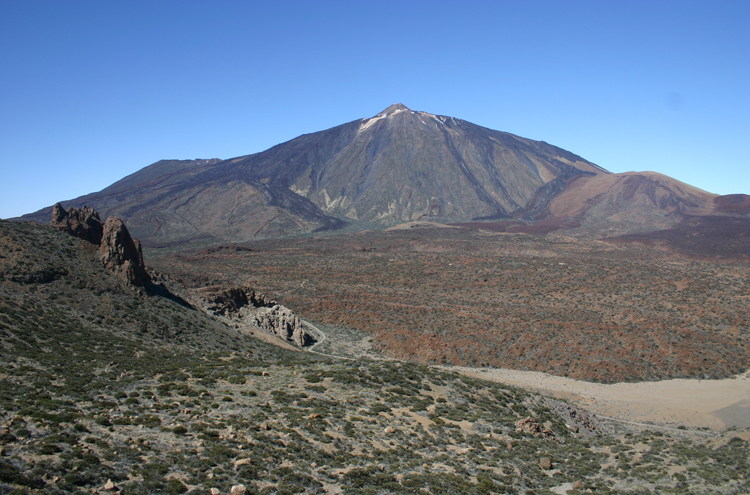 Subsequent eruptions have filled in much of the abyss, creating in a geological scintilla the much higher - grand but not lovable - peak of El Tiede (at 3,718m) in its centre, with great lava flows running off it into the crescent-shaped depression, which has filled up a long way but is still surrounded by huge cliffs on its southern curve. 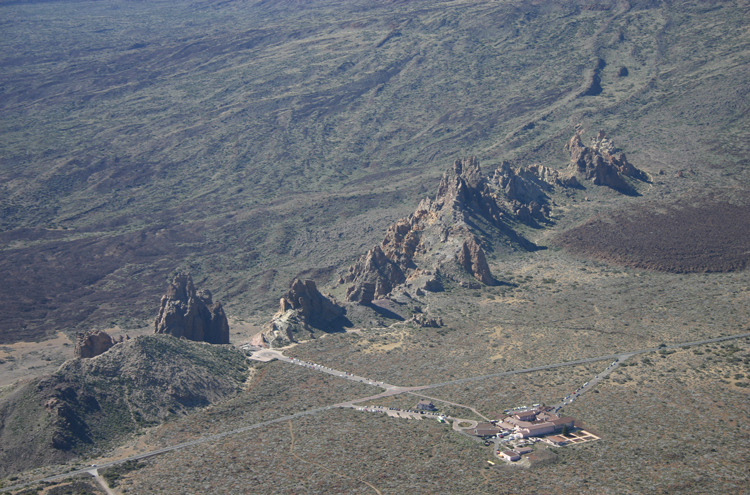 The present Las Canadas caldera is 16km long and five or so wide, a series of arid gravelly flats almost overwhelmed by the vast lava flows of the millennia. This natural and visual drama makes for thrilling walking it is in our Top 100. 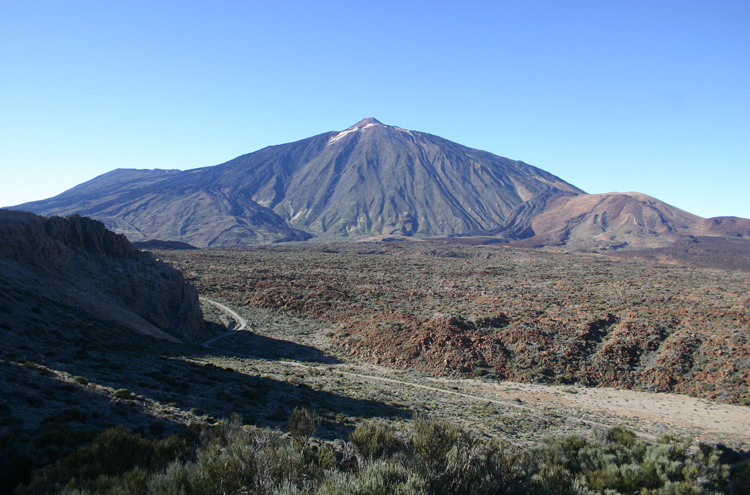 See our Las Canadas and El Tiede page for more information. If you can, spend at least two, preferably three days in this area. 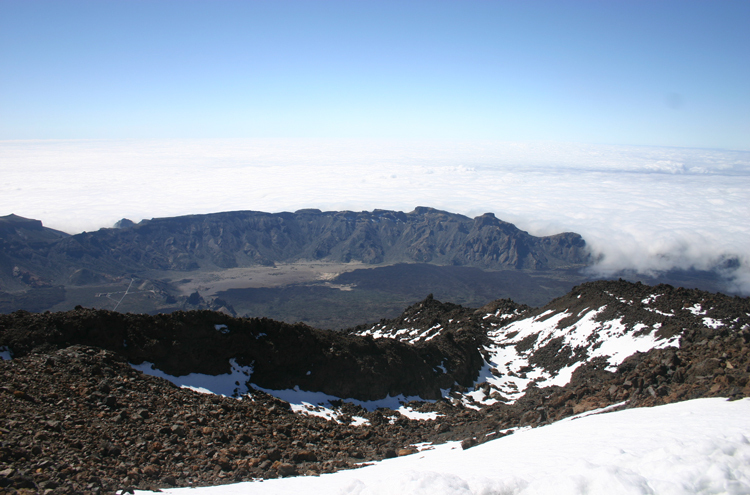 The 17km, five hour trail from El Portillo to the perfect, wooded but over-municipalised little crater of La Caldera in the La Orotava valley (or vice versa) - Cicerone 25, Sunflower 8. 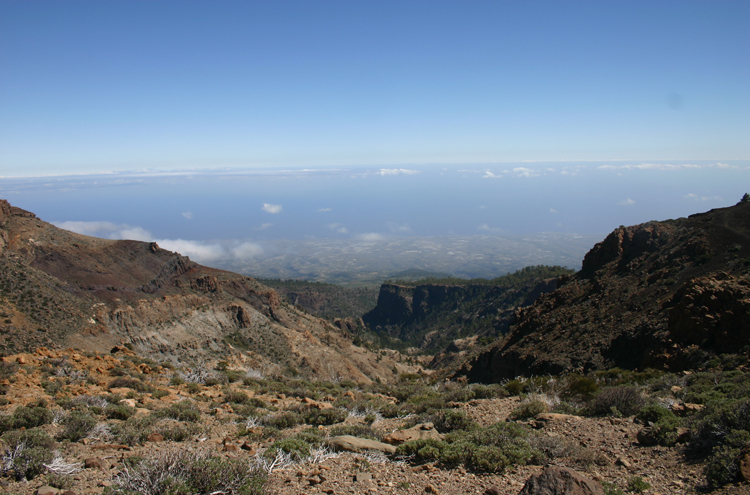 Superb views and colours as you contour round the central mountainside before dropping steeply through attractive Canary pine forests and cloudy shrub to La Caldera. 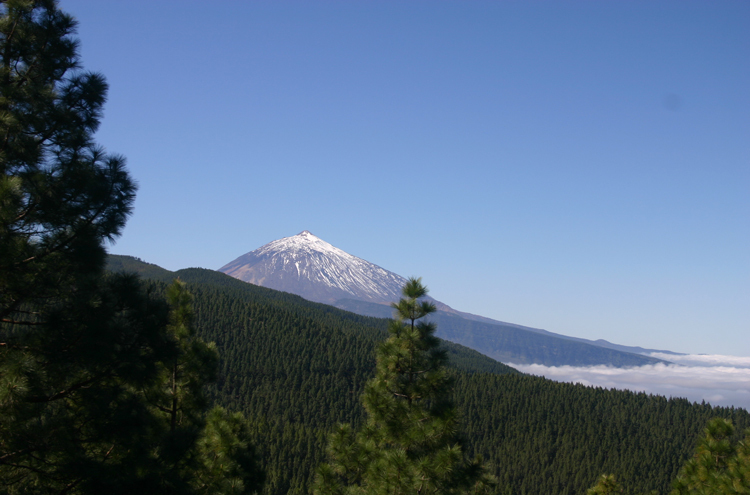 The best views are from the deep red top of the Montana de Limon, five minutes above the trail, El Tiede's snowy peak presiding over the convulsed, colourful upper slopes and quiet forests below, all of it sitting on a carpet of perfect virgin cloud when we were there. Tip: Start the walk where it leaves the surfaced road, some 3-4 km from the El Portillo junction. This cuts out some dull road bashing. The short walk in the lava-gravel area around Samara. Or a longer but superb-sounding trail from La Montanaeta to Los Silos (Sunflower 16) through bleak, cindery scenery. Various walks from Las Canadas down the mountainside to the upland towns, with wonderful sea views and volcanic scenery - see the Cicerone guide (eg walk 34): walk 41 sounds particularly intriguing, from Chiuyero down rounded slopes of dark cinders, littered with struggling Canary pines, is bleakly beautiful and dotted with intriguing little craters and other volcanic detritus. The "valley" - in fact the remnants of another vast landslip, as evidenced by its cliff walls many kilometres apart - has wonderful laurel, tree heather and Canary pine forests above the rather dreary, densely populated coastal farmland and towns, some of which - La Orotava and Puerto de la Cruz - have delightful old centres. 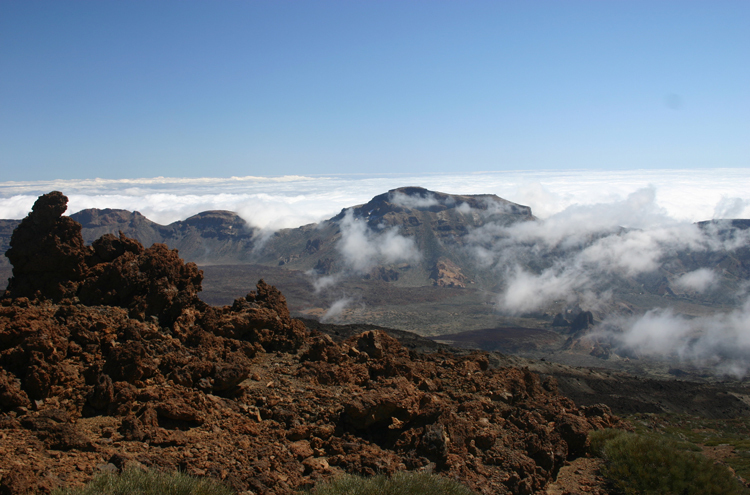 It is worth making time to walk in the area above La Caldera. 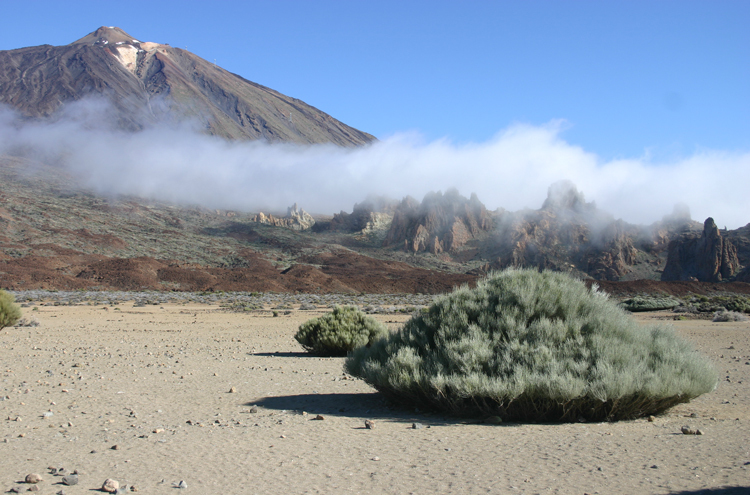 See our La Orotava page. 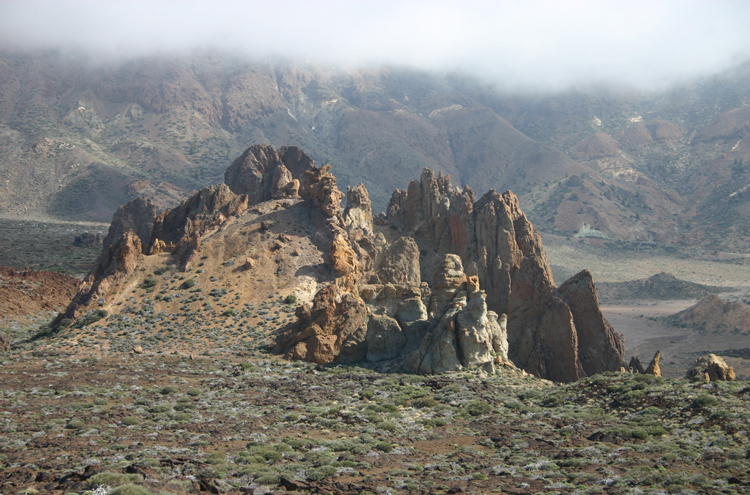 This rough, green peninsula in Tenerife's wetter north-east is also worth a visit. 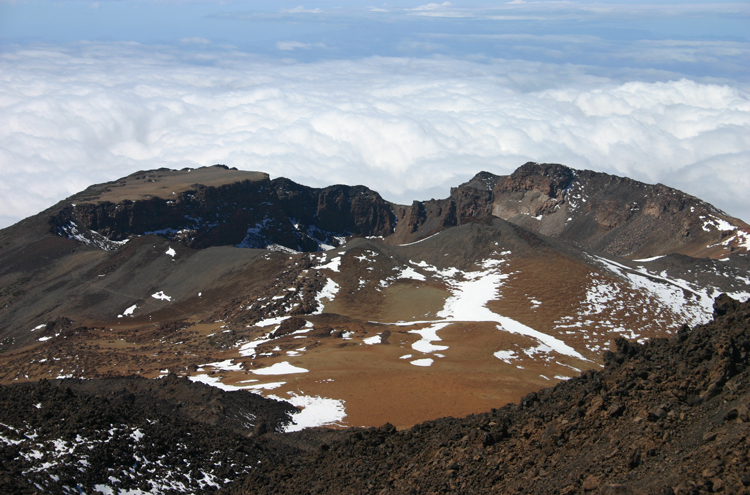 Wonderful vegetation and views of sharp, maze-like volcanic ridges, with the sea far below as an ever-present backdrop. See our Anaga Peninsula page. In the north-west is the drier, starkly beautiful Teno Peninsula. Deep, steep valleys, intriguing villages, beautiful coastline. This makes for yet more superb walking. These are well written-up in Cicerone and Sunflower. See in particular the Fleytas to Mirador de Baracan to Punta de Teno walks. The walk down to the sea on the Barranco de Masca is very popular (Cicerone 42-44). Sunflower has various options, including No. 19, from La Tabaiba to Buena Vista. On arrival: stay at Puerto de la Cruz or La Orotava; short Orotava walk. Day 2: Walk in El Portillo area on western upper slopes to acclimatize. Stay in Las Caadas Barador. 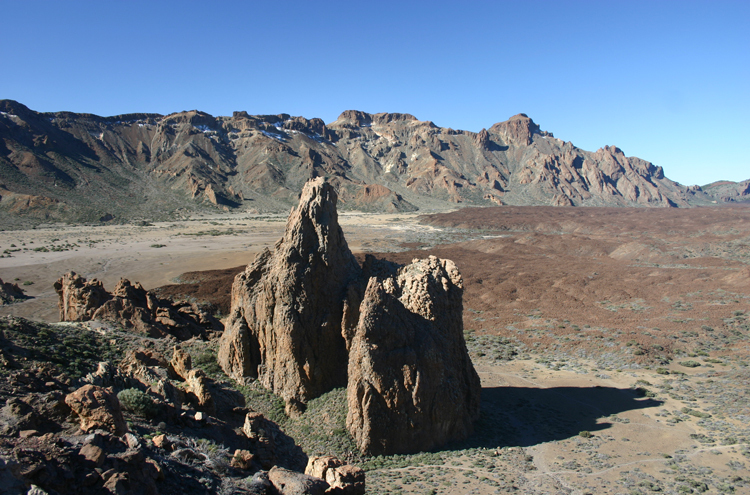 Day 3: Roques de Garcia, early enough for good light; short rest, then La Guajara, returning in late afternoon light. Day 4: Ascent or descent of El Tiede, if weather permits (or swap with Day 5). Day 5: More walking in Las Canadas or outer slopes, to suit your tastes. Day 6: Walk on Teno or Anaga peninsulas, depending on which airport you fly from.